Martha & Big Bird!!! | TRAVEL-rrific! Now here’s a combo I never thought I would mention in the same blog! Martha Stewart & Big Bird? Thanks once again, to the geniuses over at Beaches Resorts, they have partnered with Martha Stewart to exclusively offer five unique Martha Stewart Crafts Studio classes using Martha Stewarts Crafts tools to glitter, stencil, paint and more, in which Beaches Resorts guests will come away with a handcrafted, personal souvenir of their stay. Postcard, punch and stencil fashion and glitter classes are recommended for family members ages six and up with scrapbooking and stencil fashion classes recommended for ages nine and up, but younger kids are welcome if accompanied by an adult. All classes cost $10 each with the exception of the Postcard Class, which is $8. In regards to the arrival of Big Bird – well it’s about time! 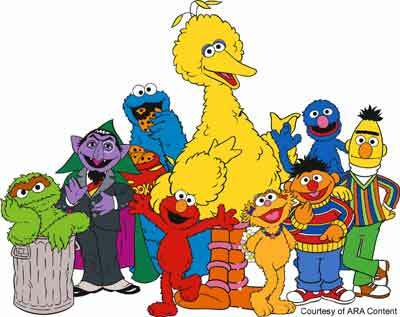 He joins his friends down in the Caribbean – Elmo, Zoe, Grover, Cookie Monster, Abby Cadabby, The Count and Bert & Ernie for the Aventures with Sesame Street. There is no better time than now to book that dream family summer vacation to the Turks & Caicos or Jamaica.